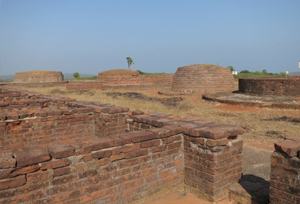 Located on the north west of Timmapuram just 9 miles from the beautiful city of Vishakapatnam, Bavikonda is amongst the most famous and oldest Buddhist sites in India. The remains of this place stand as a testimony to the great Buddhist Empire that once subsisted in the southern part of India. The site attained the name owing to the presence of the wells on the mount. The work of art found here on the hill-top are Roman coins, iron objects, Pottery, Satavahana coins, Tiles, Inscriptions and moulded bricks. There is a Bavikonda Monastery that was erected in the 3rd century BCE and one must not forget to pay a visit to this while on a tour to Bavikonda.